All BEST Members are invited to create a book for our first Carnival Challenge! Make a book that reflects some aspect of the carnival season. Traditions vary locally, do whatever feels right for you: Whether your books has venetian China masks, or is designed for Brasilian Samba Dancers is up to you. Have your book finished, photographed, and listed in your Etsy shop by Thursday, February 11th. Tag your article with "BESTcarnival" So that it can easily be found by searching. Multiple entries are allowed as long as they are truly different entries (not just different colors for the same general book design). The books will get presented on our blog on February 12th with an image. Readers can vote for their favorite book in an anonymous poll. The winner is determined on the day after Mardi Gras, on Ash Wednesday (February 17th). We give out the award to the bookbinder who made the most popular book. 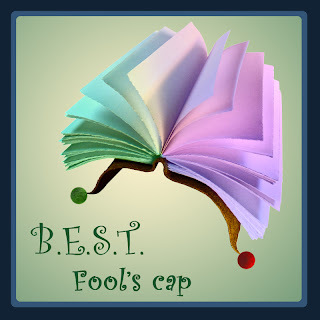 The award includes: a special blog feature on Friday February 19th, unlimited bragging rights, and the right to display the fool's cap graphics on his/her own website. The New Member Blogs Page!